This article is ©IFS. Reposting in any format is not permitted. The season officially began for Russia’s top skaters at the 2018 test skates in Moscow Sep. 8-9, where they presented their programs for the first time to the public and media. While other major figure skating federations hold their national test skates at the beginning of the season behind closed doors, Russia held the free skates at the Megasport Arena. There was a huge interest in this event this year with over 6,200 paying spectators in attendance, and almost 100 accredited media representatives. The skaters had presented their short programs in Novogorsk on Saturday. This was not open to the public because of its location at the Olympic training base. The Megasport Arena was not available on Saturday. 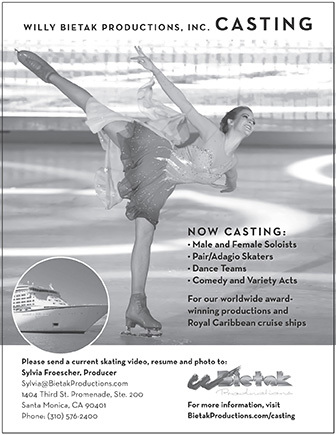 It is a smart move to give skaters the opportunity to perform in front of a large audience before their first competition after the long off-season break. For most, their last competition was Worlds in March or, for others, 2017 Russian Nationals last December, so this was a good opportunity to get that competitive feeling back. For Evgenia Medvedeva and Alina Zagitova the test skates were the first event both had attended since Medvedeva’s much-discussed coaching change. Medvedeva arrived in Moscow on Sep. 5 with her new coach Brian Orser and choreographer David Wilson. Naturally, she was nervous, but she has always been mentally strong and dealt well with her nerves. Medvedeva left a good impression at the test skates, even though she forgot part of her long program to “Mumuki” and Astor Piazzolla’s “Libertango.” The 18-year-old was better prepared in her “Orange Colored Sky” short, an upbeat, jazzy piece by Natalie Cole that works well with her new look and Audrey-Hepburn-style bangs. Orser has not yet had much time to work with Medvedeva as she went to him only in June, but he has already improved her double Axel. Orser is looking forward to working more with his new student, notably on skating skills and her Lutz technique. The audience at Megasport Arena warmly welcomed Medvedeva and gave her rousing applause, which for sure was a relief for her since some people had made nasty comments about her switching coaches and moving to Canada. Apparently not everyone can deal with the fact that Medvedeva is the first top Russian skater to train abroad with a non-Russian coach. Luckily, these dissenters are in the minority. Zagitova also had difficulties. As the new Olympic champion she has had to deal with enormous attention, something she was not used to. In the months since the Games, she has matured physically and is a gorgeous looking young lady now. The 16-year-old put out a clean short program to “Phantom of the Opera,” but she looked a little shaky. Zagitova did not attend the training camp. She was suffering from an allergy and only came to Novogorsk for the morning practice the day of the short program. Her music for the short has so many cuts it sounds hectic. For the long program, her team picked “Carmen” — a skating warhorse — but it is music she likes and has wanted to skate to for a while. Elizaveta Tuktamysheva looked strong in practice and also in her programs. Her short is set to “Assassin’s Tango.” The free is an upbeat mix to “You Don’t Love Me” by Caro Emerald, “Petite Fleur” by The Hot Sardines and “Cat Groove” by Parov Stelar. She landed several triple Axels in practice and also pulled one off in the long program with a three-turn out on the landing. “The triple Axel has been going well in practice and I want to do it in the program,” Tuktamysheva said. She is not doing the jump in the short program yet, but that might change when she gains more consistency with it. Since Tuktamysheva is doing a triple toe-triple toe combination for now, she will probably need the triple Axel in order to be competitive with the other top ladies that usually do triple-triple combinations with Lutz or flip or, in the case of Zagitova, Lutz and loop. Maria Sotskova was a pleasant surprise in her Latin short program that showcased a different side. The “Summertime” free is more in her usual, elegant and slower style, but also pleasant to watch. Sotskova has been accepted as a choreography student at the famous GITIS institute in Moscow, and plans to juggle studies and skating for the time being. Elena Radionova is not yet back to her old form. Her short program to Amy Winehouse’s “You Know I’m No Good” is something new for her. Her long to “Cinema Paradiso” has potential as well, but she needs to get her consistency back if she wants to fight for a place in the limelight. Sofia Samodurova, who trains with Tuktamysheva under Alexei Mishin, has moved up from the junior level and is another promising young skater. Daria Panenkova, who recently left Eteri Tutberidze’s group after some disagreements, now trains with Anna Tsareva, but she, too is not consistent right now. Polina Tsurskaya also left Tutberidze and joined Elena Buianova’s group at CSKA Moscow in May. The tall, powerful skater has beautiful jumps and is also very musical. If she nails her jumps, she has a good chance to be at the top. Stanislava Konstantinova from St. Petersburg needs to ensure she does not under-rotate her jumps. She is also a beautiful skater with lots of potential. Her short is to “Malagueña.” She has kept her “Anna Karenina” free program from last season. Nine senior ladies were invited to the test skates and all of them are world-class competitors. The depth of Russian ladies’ skating right now is unprecedented and the flow continues, if you look down the pipeline to the junior and even the novice skaters. For sure, not everyone will make it, but there are enough to jump in. Medvedeva, Zagitova and the other Russian ladies look like they will continue to dominate in the post-Olympic season. Apparently, every skater has to have a “Carmen” program once in his or her lifetime. Zagitova is not the only one on the Russian team using this music this season. The battle of the “Carmen’s” was the epic showdown between Katarina Witt and Debi Thomas at the 1988 Olympic Winter Games. Thirty years later, two Russian men are apparently set to repeat that battle. Mikhail Kolyada and Maxim Kovtun both chose music from “Carmen” for their long programs. Kolyada obviously is the one to beat. The quality of his skating and his jumps is the best in Russia (and amongst the best in the World). In the off-season, he worked with Stéphane Lambiel, who choreographed his new short program to “I Belong to You” (Mon Coeur s’ouvre à ta voix) by Muse and also helped him with the footwork section in his long program. He then went to California to work with Rafael Arutyunyan on his technique. Consistency is what Kolyada is lacking to make his way to the very top. “This really helps to move forward. You sometimes have to change the environment and the circle of people around you to relax mentally,” Kolyada said. Kolyada showed excellent skating at the test skates, and his programs were well received. However, he fell back into old habits when he popped the toe in the short and an Axel in the long program. He wants to start the season with easier content, only including the quad toe in his programs, but he continues working on the quad Lutz and Salchow. He hopes to show them later when they are more consistent. The role of the torero suits Kolyada a lot better than you might expect. The Muse program is, not surprisingly, right up his alley. Kovtun sometimes seems like a hopeless case. On one hand, he is very talented and was once touted as the next big thing in Russian men’s skating. On the other hand, he has a tendency to get distracted from training and implode in competition. The now 23-year-old missed the Olympic season as he struggled with injuries. He wanted to retire after withdrawing from Russian nationals in December 2017 following the short program. But he then felt he would not forgive himself later if he did not give it another shot and asked his former coach Elena Buianova (Vodorezova) to take him back. She thought about it and then gave Kovtun another chance. Like Kolyada, he remembered Evgeni Plushenko had skated to it in 2002. Kovtun was a bit miffed when he found out that Kolyada is also skating to “Carmen,” but maybe the two of them and Zagitova could mount an exhibition program and perform the piece together. That would leave Kolyada and Kovtun to decide who plays Escamillo and who is Don José. Dmitri Aliev rose to number two on the Russian men’s team last season. He is without doubt a great talent and has many qualities. The 19-year-old went for quad toes and Salchows in both programs at the test skates, but missed them in the short and also the Salchow in the free. “The quad Lutz is not there at this moment, but I am confident that it will show up toward the middle of the season,” Aliev said. His short, to “Modigliani Suite” by Guy Farley, is a beautiful program, choreographed by Olga Glinka and Valentin Molotov. It is about overcoming difficulties on the road to success. Unfortunately, at this point, this program does not really come across and the music seems somewhat monotonous. Maybe it needs more mileage. Sergei Voronov, who will turn 31 on Oct. 3, is the veteran on the Russian team and still going strong. He has added the quad loop to his repertoire and went for it in both programs. It was not perfect, but Voronov deserves respect for risking it. For his short program, he chose “Appassionata” by Secret Garden, choreographed by a former rival, Artur Gachinski. Voronov asked Denis Ten to choreograph his free skate and went to Kazakhstan in May. Voronov had an idea for the program, but Ten convinced him to skate to “Way Down We Go” by Kaleo. “It is his (Ten’s) program, his idea, and even when I went out to skate it today (at the test skates) I had this thought that Denis from somewhere above is looking at me,” Voronov said. Alexander Samarin, who had knee surgery earlier this year, is skating to “Dave Not Dave” by Cold Blood and to “The Greatest Showman” soundtrack. He obviously has been working to improve his skating skills and posture, but still needs to catch up in this department. Andrei Lazukin, a student of Alexei Mishin in St. Petersburg, delivered two solid performances to “I Put a Spell on You” (short) and Rachmaninov‘s dark “Prelude in C Sharp Minor” (“Bells of Moscow”) (free). His long program included quad toes and triple Axels. Artur Dmitriev, Jr., is now coached by his father, two-time Olympic pairs champion, Artur Dmitriev. World Junior Champion Alexei Erokhov had to withdraw from the test skates as he pinched a nerve in the morning practice. It will be interesting to see what happens with the Russian men this season. In decades past, pairs had been a Russian stronghold, but its dominance has crumbled with the rise of the Chinese teams and those from other countries. No Russian pairs team won a medal in PyeongChang, but Evgenia Tarasova and Vladimir Morozov earned silver at the subsequent World Championships. They switched coaches in the off-season and are now working with Maxim Trankov, the 2014 Olympic pairs champion. Tarasova and Morozov have once again opted for something modern and different with their Lenny Kravitz short program “Are You Gonna Go My Way,” but it does not suit them as well as their modern classical long program to “The Winter” by Balmorhea. At the test skates, the throws were solid but not the side-by-side triple toes. Their main rivals in Russia right now are Natalia Zabiiako and Alexander Enbert, who skate to “Alexander Nevski” by Sergei Prokofiev for the short and “Toi et Moi” (“Me and You”) by Igor Krutoi in the free. This team wants to finally step out of the shadow of the others and it has the potential to do so this season. Behind these top teams, two that moved up from the junior ranks this season are looking to make an impact. The 2018 World junior champions, Daria Pavliuchenko and Dmitri Khodykin from Moscow, have been developing well over the summer. They looked good at the test skates, attempting side-by-side triple flips in their “The Great Gatsby” long, but she fell. Alexandra Boikova and Dmitri Kozlovskii struggled last year, but left a good impression at the test skates with their jazz version of “Dark Eyes” short program and their long to “The Nutcracker” (same program as last season). Alisa Efimova and Alexander Korovin, who train with Boikova and Kozlovskii at Tamara Moskvina’s school in St. Petersburg, had issues with some elements. Ksenia Stolbova and Fedor Klimov made their split official just before the test skates. Stolbova wants to continue her career with Andrei Novoselov, a Russian who competed in pairs for France the past few years. Stolbova and Novoselov have been training for about two months under Nikolai Morozov. Novoselov needs to be released from France and this team will have to sit out the season internationally to observe the ISU waiting period. Stolbova remains optimistic that everything will be sorted out and hopes to compete at Russian nationals in December. Klimov announced his retirement and plans to turn to coaching. As with the pairs, Russian ice dance has lost its leading edge. With seven-time national champions Ekaterina Bobrova and Dmitri Soloviev not competing at this time (though they have not excluded a comeback), it’s a new game with several teams fighting for the leadership. National silver medalists Alexandra Stepanova and Ivan Bukin are the heirs apparent, but they have strong competitors in Victoria Sinitsina and Nikita Katsalapov, Tiffani Zagorski and Jonathan Guerreiro and Betina Popova and Sergey Mozgov. Stepanova and Bukin have an original Tango to “Carmen’s Story” by Edith Piaf, a really captivating piece of music that has probably not been used in skating before. Their free dance is a Blues song, “Am I the One” by Beth Hart, which was choreographed by Peter Tchernyshev. Sinitsina and Katsalapov are coming back from a rough end to last season. They had to withdraw from nationals in the middle of the free dance after Katsalapov suffered an injury. This season they have chosen “Verano Porteno” by Astor Piazzolla for their short dance. It suits them well. Their free dance is set to “Air” by Johann Sebastian Bach and “Praeludium and Allegro” by Fritz Kreisler. This music highlights their classical style very well. Popova and Mozgov are quite different from these two teams. They have a lot of drama and energy. Their music choices speak for themselves: “Tango in a Madhouse” by Alfred Schnittke and “Master and Margarita” by Igor Korniliuk. In the spring they switched to train with Anjelika Krylova, who returned from the U.S. after coaching for 24 years in the Detroit area. She has established a new dance school with Oleg Volkov. Zagorski and Guerreiro had a breakthrough last season. They went to the Olympic Winter Games when Stepanova and Bukin were “not invited” and then to Worlds when Bobrova and Soloviev chose not to go. Zagorski and Guerreiro have strong material, especially their “Blues for Klook” free dance, choreographed by Christopher Dean. Unfortunately, Tiffani had some problems with her knee and they were not able to participate in the public part of the test skates. However, they received feedback from the experts at the training camp. Anastasia Shpilevaya and Grigory Smirnov who train with Stepanova and Bukin under Irina Zhuk and Alexander Svinin were a promising junior team, but they missed most of the past season after he suffered a severe injury to his Achilles tendon and she a knee injury. They looked sharp at the test skates so it will be interesting to see where they will fit in this season. World junior champions Anastasia Skoptcova and Kirill Aleshin attended as spectators only, Skoptcova is recovering from an ankle injury and was off the ice for a few weeks. They are now back training and aim to compete at Skate America. Alla Loboda and Pavel Drozd, the 2017 World Junior silver medalists, split up in May. A minute of silence was observed in memory of Denis Ten at the Megasport Arena. Ten had trained in Moscow for many years and competed several times at the Grand Prix in that city. He was assigned to Rostelecom Cup this season.